Brett Phillips isn't quite sure how to explain his eye-opening run in the California League, but he's certainly content to ride it as long as he can. The Astros prospect posted his first career five-hit night on Friday, lifting his average to .380 through 18 Cal League games, as Class A Advanced Lancaster beat Inland Empire, 9-3, at San Manuel Stadium. "I wish I had an answer for you," Phillips laughed, "but it's just a matter of going up and having a good at-bat every time, seeing the ball up and just putting good swings on pitchers' mistakes. What it boils down to is taking advantage of those mistakes." 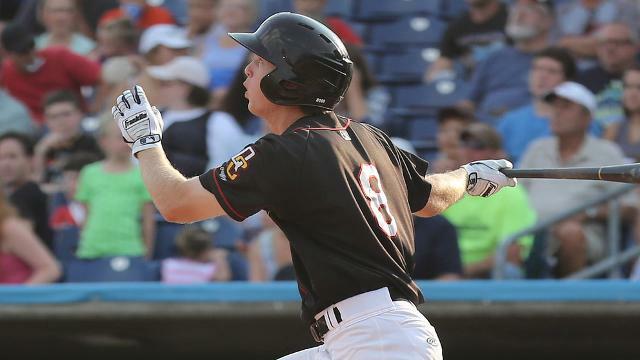 Since he arrived in Lancaster on Aug. 4 on the heels of a solid showing in 103 games with Class A Quad Cities, Phillips has taken advantage of mistakes on a majority of his days at the plate. The 2012 sixth-round pick has hits in 14 of his 18 games at the Class A Advanced level, including six multi-hit performances. Through the first three year's of his career, no multi-hit game was as prolific as Friday's. "Once I got that third hit, you get the momentum rolling," he said. "You're seeing the ball well and, like I said, taking advantage of those mistakes, getting a good pitch up in the zone to drive." Phillips singled to lead off the game, stole second and scored on Jon Kemmer's two-out single. He brought home a run with a sacrifice fly in the second, singled again in the fourth and added doubles in the fifth, seventh and ninth to produce two more runs. . The 20-year-old has hits in six straight games, with Friday's performance bumping his average 47 points to .380. He's batting .424 in 15 games as the JetHawks' leadoff man, .542 in 24 at-bats leading off innings and .444 in 45 trips to the plate with the bases empty. "It's been a blessed season," he said. "I'm just keeping my head down and playing good baseball and finishing strong. I try to stay away from all the talk, whatever it is about me, whether it's being positive or negative." The win put Lancaster one game up on Inland Empire and Lake Elsinore in the race for the South Division second-half title. Having already captured the first-half title, the JetHawks (75-56) are three games behind Stockton for the league's best overall record. "Knowing that we still have a chance to win the second half and that we're already in the playoffs, it's just an awesome atmosphere to play with these guys," Phillips said. "It's just been awesome playing for [manager] Rodney [Linares]. And knowing that I have a chance to help this team win a ring is awesome. We'll see come the playoffs. Hopefully, we put it all together. In the playoffs, it's not necessarily the best team that wins, it's the best team that day that wins." Lancaster's Evan Grills (2-3) turned in a quality start, allowing three runs on four hits and three walks while striking out four over six innings. Clint Sharp (3-3) took the loss after surrendering five runs on seven hits and three walks in four innings. He did not record a strikeout.